Rellenthil, also known as Riverfield or Riverfeld, is a town in the heart of Summerset Isle, west of the Oleander Coast and north of Alinor. It is home to the House of Reveries, a famed acting troupe. Many re-purposed Aldmeri ruins dot the town, including its most famous building: the amphitheater where the House of Reveries holds its auditions. Around 2E 583, a large sinkhole mysteriously opened up near the town. It was soon discovered that the Sea Sload K'Tora, in collaboration with the Daedra-worshipping Court of Bedlam, had created the uncommon phenomena in the firm and unchanging foundations of Summerset Isle. A monk of the Psijic Order by the name of Valsirenn, with help from the Soulless One, managed to stabilize the walls to prevent them from crumbling down and the sinkhole from growing deeper and wider. At the same time, Abyssal Pearls were used by members of the Court of Bedlam to power an Abyssal Geyser on the coast near Rellenthil, which threatened to make the very land be swallowed by the ocean and summoned hordes of beasts from the deep sea. 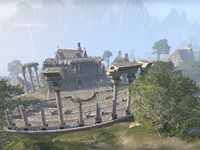 After the threat of the sinkhole was averted, Rellenthil's canonreeve's son—Nedoril—publicly acknowledged his implication in Daedra-worship, as well as conspiring with the newly founded Court of Bedlam and with the Sea Sloads. 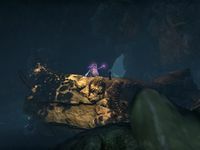 For this, he was executed by the Eye of the Queen Razum-dar without a trial, fearing that the canonreeve might oppose the Crown to protect his son. Canonreeve Farmeldo affirmed his allegiance to Queen Ayrenn after the event. The town was still in existence during the Tiber Wars, where it became known as Riverfeld. During the Imperial Simulacrum, it was known as Riverfield and was ruled by Duke Solimon. It had a rivalry with Archen Grangrove, Corgrad Wastes, and Marnor Keep. It was neighbored by several settlements, including Ebon Stadmont in the northwest, Old Falls in the northeast, Riverwatch in the west, and Rosefield in the east. Rellenthil has been an integral part of the realm of the Summerset Isles since its foundation by the Alinor Monarchs. A canonreeve is tasked to rule the settlement. The town is known for its acting troupe, the House of Reveries. It consists of anonymous, masked artists who regularly make performances in the town's amphitheater. Those who join the House must hide their true identities, to prevent them from using their role for personal gain. The Manor of Masques is their base of operations, but its members travel all across Summerset to perform. Every traveling troupe is led by a Maestro. In contrast, a Grand Maestro acts as the leader of the entire House of Reveries. The Maestros of this famed troupe have organized performances in Rellenthil's amphitheater since the earliest days of settlement. As heirs to the long Altmer legacy of cultural arts, membership is exclusive: Only true talents may join, and they are selected by the Grand Maestro in Rellenthil. Nobles especially appreciate the performances of certain members of the House, who often entertain highly esteemed social circles in Summerset. This page was last modified on 22 March 2019, at 13:41.